© AP Photo/Jose Luis Magana A protester outside of the White House. The Democrats have a new moral crusade. It's youth-oriented and free of identity politics. It's got nothing to do with Trump, or Russia. Today's Democrats are fighting for your right to get baked. If you're skeptical, please understand that this is not just a plunge into unfettered hedonism. Sen. Cory Booker (D-N.J.) really said it all with his ostentatiously-titled Marijuana Justice Act, which decriminalizes the drug and also expunges older marijuana-related convictions. He's one of a growing crowd of Democrats who are lining up to tout the economic and moral blessings that might flow from legal weed. This is about freedom, they tell us. It's about opening opportunities to women and minorities. Frankly, we've just been very unfair to our spiky-leaved friend. The winds do seem to be changing on this issue, and not just among Democrats. 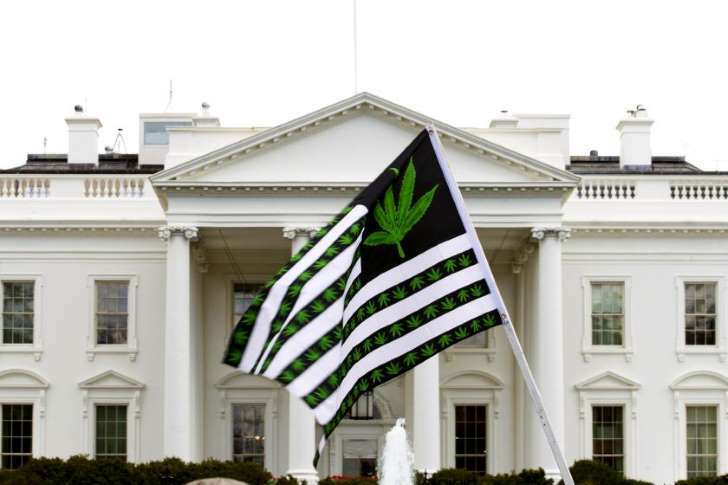 President Trump, possibly in a peevish effort to snub his attorney general, has declared his willingness to "protect" states that have legalized pot. John Boehner, a longtime foe of marijuana, is now personally sitting on the board of a cannabis company. Proponents of legalization point to the tens of thousands of jobs and hundreds of millions in revenues that have sprung from Colorado's 5-year-old market. Everyone keeps repeating how the new laws have really "worked"; post-legalization, "the sky hasn't fallen." That's a disturbingly low bar. One wonders: Is empyrean collapse the only thing that might move Colorado to reconsider a decision that has filled the state with dispensaries, pot tourists, and rising numbers of homeless addicts? Changes in policy can be destructive even if they don't bring civilization to an end. If, as seems fairly likely, legal pot is soon available from sea to shining sea, how will our grandchildren view that decision? Will it seem to them that 2018 was the right time to throw open the gates to yet another recreational drug? It's clear enough why politicians are warming to pot. They're chasing public opinion. Since 1990, the percentage of Americans who think pot should be illegal has fallen by more than half. A solid majority now supports legalization. Younger voters are especially enthused. To a politician's eyes, this is not a battle worth fighting, and everyone loves an opportunity to infuse moral triumphalism into a thoroughly winnable crusade. Jeff Sessions' protests notwithstanding, this ship is unlikely to turn. Public opinion can be wrong, though. It's understandable that the public would be eager to dial back the War on Drugs, with its (somewhat deserved) associations with police brutality and mass incarceration. At the same time, it's genuinely shameful for us to celebrate booming new markets and burgeoning state revenues, considering what that means on the consumer side. It means that people are smoking (or eating) more pot. In Colorado and Washington, ferocious statistical debates will continue to rage about addiction rates, youth consumption, drug cartels, auto fatalities, and so forth. This much at least is clear: When states legalize marijuana, people consume more of it. The data suggest that frequent users are the main driving force behind those rosy markets. The revenues are high because the humans are high. Is this really cause for cheer? I went to high school in Boulder, Colorado, so I know perfectly well that nice people can smoke pot. But I also know that pot can be addictive and lifestyle-invasive, with particularly malignant effects on juvenile brains. It can disrupt memory and attention spans. It reduces drive and executive function. Physical coordination can also be diminished, potentially affecting a person's ability to drive safely. Predictably, these effects are far more pronounced in the heavy users who are the primary clientele for the cannabis industry. How will this affect society at large? We live in an era when significant numbers of people are struggling to get a handle on the fundamentals: holding down jobs, developing healthy life habits, managing finances and personal relationships. Our social workers have crushing case loads, and our foster care system is increasingly strained. Young people are marrying less, but ever more prone to drug addiction. These grim realities reflect many casual factors, but we needn't become sneering moralists just to wonder: Will a massive infusion of psychoactive drugs help this situation? Policy always involves trade-offs, and some might argue that higher addiction rates are an acceptable price to pay for greater freedoms. To a committed libertarian, for instance, marijuana bans look like paternalistic nanny-statism, which is contemptible even if it does protect vulnerable citizens from a great deal of suffering. That's not the line Democrats are taking, though. Instead, Chuck Schumer is trotting out old canards about how cannabis "doesn't hurt anybody else." Hearing him tout the virtues of legalization in Colorado and Washington ("lots of good and no harm! "), one is reminded of Purdue Pharma, the pharmaceutical company that spent years (and millions) telling doctors that opioids weren't seriously addictive when prescribed to pain patients. It's stunning that educated people ever believed this, but many did. Today, many are equally anxious to believe that legal pot probably has little to do with Colorado's sharp increase in auto accidents. And there are homeless people everywhere, right? Correlation doesn't equal causation. Marijuana isn't heroin. Even so, we can learn some lessons from the opioid crisis that devastated so many American towns. The first is that predatory markets always hit vulnerable populations the hardest. Marijuana abuse may never become a serious problem among educated, financially secure people with strong networks of personal support. The story is likely to be different in regions that are economically depressed and culturally desiccated. Of course, these are also places where people are already insecure, ill-equipped to cope with another catastrophe. Legalization could have a big impact in those areas, because availability really matters to indigent populations. The opioid crisis was partly driven by Mexican heroin dealers who set up shop in mid-major towns, perfecting their delivery system until it was effectively a black-market Amazon. Another major factor was the "pill mills" (sham clinics that effectively functioned as recreational opioid dispensaries), which flooded America's most depressed towns with addictive drugs. Both testify to the significance of efficient distribution as the harbinger of widespread addiction. When marijuana is legal, we can be confident that cannabis companies will find their target demographics. Here's another lesson from the opioids. When indigent populations are suffering, the rest of the nation can be awfully slow to notice. Many thousands had died of opium overdose before America started to consider that it had a bit of a drug problem. That's not going to happen with pot, which is far less likely to kill you. But if it took thousands of corpses to persuade authorities that OxyContin was a problem, how much havoc would marijuana have to wreak on indigent citizens and families before anyone would bother to reconsider the wisdom of legalization? How many kids will have to be removed from their families because their addicted parents can't quite get around to feeding them or taking them to school? How many young adults will watch social lives and career plans disappear into the vortex of addiction, while their parents watch despondently? These sorts of cases might not appear on Schumer's radar, because he's more interested in courting young voters and securing state revenues. It's these kinds of cases that should remind us, though, that there's no such thing as a victimless, self-destructive habit. Innocent people always get hurt. There are some controlled substances that simply have no place in the life of any responsible person. Marijuana is not like this. It can be enjoyed moderately, and a healthier culture might be able to legalize it without too much danger of abuse. Regrettably, we don't have that kind of culture. Reading the tea leaves, it seems likely the wheels of legalization will continue turning, so cannabis companies have cause to rejoice. Be prepared, though. We're in for some wicked withdrawal symptoms.